For photos inside the luxury penthouse Click Here ! Duquesa Village is a residential complex in Manilva, one of the most privileged sites of the whole Costa del Sol. A fantastic location for a Costa Del Sol Vacation. One step away from the La Duquesa Golf Course and a stroll away from a sweeping beach sporting the European Union flag. This not a typical apartment as it is a large double floored duplex with three bedrooms and two bathrooms and two large private terraces equipped with seating sun-loungers, dining table and barabacue. The Luxury Penthouse offers spacious air-conditioned accommodation laid out on two floors. The property is built to an extremely high standard and is beautifully furnished.For your entertainment, we have a Bang and Olufsen TV and Bang and Olufsen Music System as well as Satellite. We also have a good library of contemporary movie DVD’s for you to watch.The entrance hall leads into a large living/dining room with two adjoining double bedrooms with a large family bathroom. 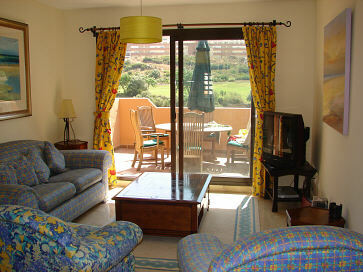 There is a large sun terrace with Golf and Sea views outside the living room. All of the floors and bathrooms are finished in fine marble tiling and equipped with attractive fittings. The kitchen is brand new and modern, with an electric cooker and ceramic hob, dishwasher, washer, large fridge freezer and micro wave. In fact everything you would need to make the perfect meal in the Penthouse. The upper floor houses the master bedroom with vaulted ceilings, it’s sense of luxury is made complete with a beautiful four poster bed, made from of maple with cherry inlay. The master bedroom also boasts en-suite bathroom with hydro-massage tub and walk in wardrobes. Walking onto the privates terrace, complete with sun-beds, you have a fantastic view from a large terrace down the 14th fairway of Duquesa Golf and Country Club to the Sea. Duquesa Village has many swimming pools built at different levels and connected up to each other by delightful waterfalls, so that you can relish your new home with all your senses. It also boasts extensive garden areas for a pleasant stroll or for playing your favourite open-air sports without leaving the complex.The property has two underground parking spaces and is 20 metres from the pool complex and sports area on the Duquesa Village complex. The apartment affords you unbeatable views of sea and mountain. Bathed in sunshine, lapped by a soothing sea and set amidst unspoilt nature, this prestigious zone on the Mediterranean has these and many other charms to boast. Only 2 Km away lies one of the most splendid marinas of the whole Costa del sol, the Puerto Deportivo de la Duquesa.